Garage Sale is Ministry of Care's #1 (and only!) fund raiser of the year. This helps fund the many ministries we participate in to fulfill the corporal and spiritual works of Mercy. Come help us raise some funds and fun!!!! Donations accepted on Sunday, June 9 from 8am -4pm; Monday, June 12th from 8am -4pm Tuesday June 11th from 8am -5pm. Please see bulletin or web page for limits. Please sign up here to work! All volunteers must sign in, register and receive a name tag in the St John’s Room each day and shift that you are helping. Instructions and where you are assigned will be in the St John's room. Must be high schooler and older. Middle schoolers with parent worker (at same time) okay as well. . 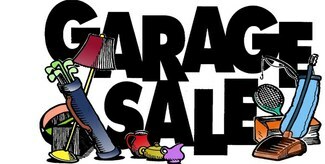 The “shopping policy” for Volunteers at the Garage Sale will be as follows: Tuesday afternoon from 3pm-6pm. We changed this so all items will be priced (or almost) and the chairs will be present to price things out. Rita and Mike will be available to recieve check or exact cash for what you buy! Heads of outside Charities or their representatives may receive pre-authorization to “shop” for donations on Tuesday for their respective charities from Jean Hinman. List of items must be given to Rita in the bank.